Since the TQWP is an oscillation horn, rather than compression, the point of maximum oscillation occurs at the port. This oscillation is what moves the air in the port. This page calculates dimensions based primarily on Fs of driver used, which is obviously not ideal. Line tuning is set to Fs of driver to critically damp it at that frequency. Calculations assume use of 19mm (0.75in) material for walls and interior baffle. Height of intenal baffle should not extend more than the center point of the driver as mounted. This calculator is not expected to give perfect results, but hopefully will be a good starting point. Qt of the driver used in a TQWT should be between 0.2 and 0.7, best results can be expected if Qt = 0.4 .. 0.5. The length of the TQWT should be agreed on about 1.0 to 1.2 x resonant frequency of the speaker. The initial cross-section Sa of the TQWT is 75 to 100% of the membrane surface, the end cross section Se is 225 to 300% of the membrane surface. 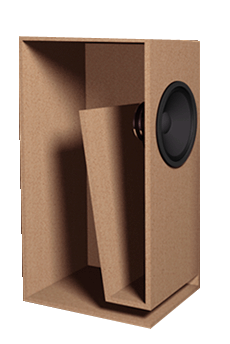 The center of the speaker should be about 40 to 45% of the total length.